There's nothing like old friends. Each time I travel back home, I get together with these girls I've known since grade school, and it always feels like I've never left. Although we hardly keep in touch, the bond we formed through all those years growing up together has remained intact, and we pick up quickly where we left off. When I was back home for a mini-break, I caught up with a dear old friend for lunch. After hours of catching up, she served these mini banana spring rolls with a dipping sauce of dulce de leche, the sweet taste of nostalgia. To make dulce de leche, simply remove the paper label from a can of condensed milk, place in a pot full of water (making sure the can is covered to the brim), cover and simmer for 2 1/2 to 3 hours. Remove the lid, and scoop out the thick, caramelized milk. Use as a dessert dip or serve with your favorite sweet bun. This post made me homesick. Lucky you, you had a taste of HOME again. I didn't know that dulce de leche is cooked this way. Looks so easy but definitely looks so good and yummy. I would like to dip my spoon into the can.. with pandesal maybe or even solo! YUM! Hi Malou, this is the way our grandmothers used to make dulce gatas. I'm sure there's a fancier way to make it now, but this sure is easy and tastes great! Yum! Will definitely try this....thanks for posting=)We also have a canned caramel topping, same texture and colour but I'm not sure if it has the same taste as dulce de leche. Ohhh that looks really good. Ooohh so sinful! It looks delicious! It feels good to get together with old friends... especially around food!! Banana spring rolls - I likey! We are big banana fans in our house so ought to give this a try. Yummy dulce de leche! I used to make it this way too. 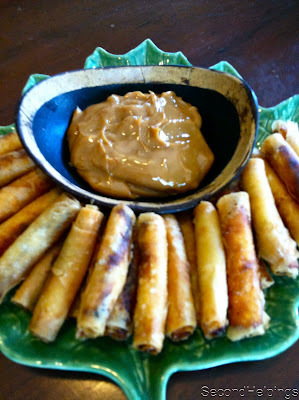 I love the idea of dipping the turon in dulce de leche...delicious! first time here,u hv a lovley space..ddl looks so tempting n delicious....visit my space as time permits..